Forget Batman and Robin – if you really want to deliver a few ‘biff-baff-boffs’ to the evil forces of negative variance, you need to take a spin with the Caped Crusader's latest recruit: Batgirl. 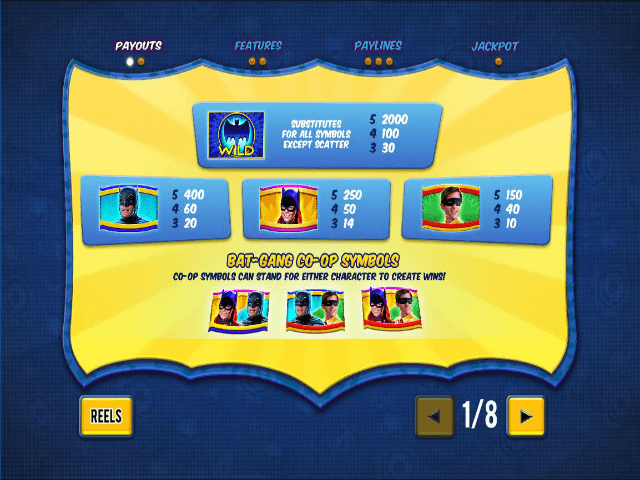 Filling the void left by Robin and capable of turning symbols into bonuses, free spins and even progressive jackpots, Batgirl is one of the latest characters in the hugely popular, retro Batman slot series. 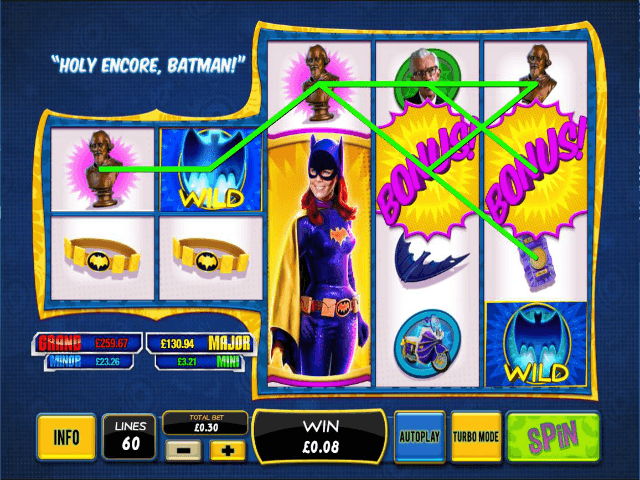 Not only is Playtech's Batman and The Batgirl Bonanza a nod to the hit TV show of the 70s – thanks to its array of familiar characters and colourful animations – but it's also one of the best progressive jackpot slots in the game right now! 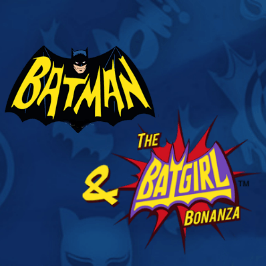 Play Batman and the Batgirl Bonanza for Real Money! Bucking the trend of reserving the best prizes for high rollers, the Batman and the Batgirl Bonanza slot game is capable of rewarding any player with a £100,000+ prize at any time. So, if you fancy an action-packed adventure where beating the bad guys means money in your pocket, Playtech has you covered with Batman and The Batgirl Bonanza slot. 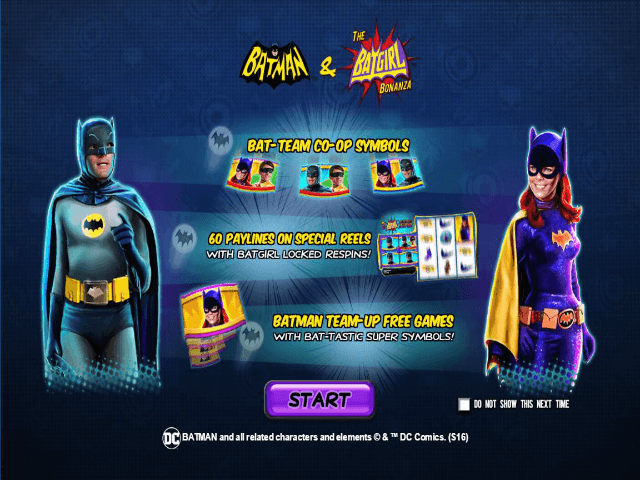 As we've said, this progressive jackpot game is based on the Batman TV show, and is part of a slot series that features DC’s most iconic characters. Inside this spinner, your favourite superhero teams up with his female equivalent in a game where novel features and overall narrative are as important as the prizes themselves. For instance, within the game’s comic book styling you'll find something known as ‘co-op symbols’. Featuring various combinations of Batman, Robin and Batgirl, these co-op symbols essentially harness the power of two characters in one single symbol. What’s more, the theme of two characters working as together in close alliance is one that jives with the Batman series as a whole. So far so good – but what happens when you actually roll a co-op symbol? Put simply, a co-op symbol is like a wild, meaning they can complete any superhero combination. For example, if you rolled in two Robin symbols and one co-op symbol featuring Robin, you'd win! Naturally, if you want to get the most value out of Batman and The Batgirl Bonanza, you’ll need to move beyond the fixed prizes and payouts and look towards the bonuses. Like every game in the retro Batman series, Batman and The Batgirl Bonanza has vast ways for you to win. Perhaps the most interesting special feature is the one that makes use of the game's separated columns. When you first familiarise yourself with the slot game, you'll notice that the first two columns are set apart from the main reels. When you match four symbols on the first two columns, this unique structure kicks into life, and they’ll merge to form a super reel. Once you unlock this bonus, you'll get five free spins and a giant wild locked in place on the separated columns. This dramatically increases your chances of making a winning combination and, therefore, banking a serious prize. 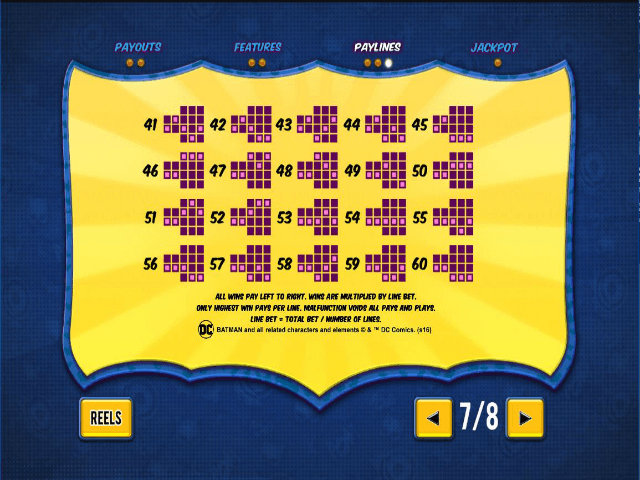 To give this game a final touch of shine, Playtech connected Batman and the Batgirl Bonanza to the heralded DC Jackpot Network, which features a progressive jackpot pooled together by all the Batman-themed games from Playtech including Batman and Mr. Freeze Fortune and Batman and the Riddle Riches. In doing this, they’ve enabled you to unlock one of four progressive jackpots at any time. Regardless of the stakes you're playing for, the progressive jackpot game can strike at any time, and when it does, you'll have to match a selection of symbols from a mystery grid. Depending on the symbols you match – mini, minor, major or grand – you could walk away with a top prize worth £100,000 from a stake as small as £0.30! Share this Batman and the Batgirl Bonanza Review today! If you like Batman and the Batgirl Bonanza, you'll love these slot titles too!